This TED talk by Bryan Stevenson about injustice and identity is worth watching. I first learned about his work as the founder and Executive Director of the Equal Justice Initiative through our own Alyson Grine. In this highly personal and engaging talk, Stevenson challenges his audience to examine our complacency about the criminal justice system’s massive imbalance along racial lines. Go to criminal court or visit a prison and the impact of the racial imbalance is overwhelming. I used to take our summer law clerks to visit Central Prison and it always generated intense questioning and uneasiness about race and crime. Stevenson also quietly but firmly challenges society’s too-easy comfort with the death penalty, as well as the practice of treating children as adults and holding them in adult prisons. Stevenson recently testified in the first hearing to take place under North Carolina’s Racial Justice Act. The School works with prosecutors, public defenders, and judges to insure that they carry out their individual responsibilities as effectively as possible within the criminal justice system. We are educators, not advocates. 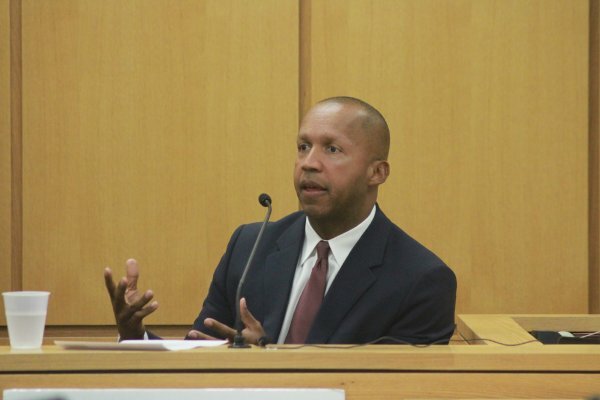 Bryan Stevenson is a quiet but powerful advocate, and I encourage you to listen to his talk. He may not change your mind. Whatever your views about crime and punishment, however, he will make you think. That’s not a bad thing. If you want to read more about prisons, and who doesn’t, here is an earlier blog post and an interesting article in today’s The New York Times about a move away from solitary confinement in some super-maximum security prisons. I just picked up a book directly related to this issue by Michelle Alexander titled “The New Jim Crow: Mass Incarceration in the Age of Colorblindness.” Saw her on a news panel recently and the discussion was heartbreaking and fascinating. Thanks for sharing. This almost but not quite eases the pain of having lost Stevenson at the last minute as a presenter at a seminar on racial bias in December, owing to the flu. Next time. I was looking forward to Stevenson participating in one of our programs. This video makes me want to find a way to try even harder to make it happen. What an impressive person.